Looking for the best solar pool heater for your in-ground or above ground pool? In this in-depth buying guide, we are going to review the best solar pool heaters in the market as well as the best accessories for solar pool heaters. A solar pool heater is an efficient, affordable and environmental-friendly way to keep your pool swimmable for longer. There are three ways to heat your pool: using an electric pool heater, a natural or propane gas heater or a solar pool heater. The first two are going to cost you quite a bit of money. Gas heaters are especially expensive – the cost of propane has been going up in the last few years. It can easily cost thousands of dollars to keep your pool at the perfect temperature all year round. Electric heaters are significantly cheaper to run than gas heaters. But they are still no match for solar pool heaters. If you want to keep your pool warm without spending a lot of money, a solar pool heater is a way to go. While a complete system for an in-ground pool is relatively expensive to buy and install, there are virtually no running costs. You are using free energy from the sun. Depending on your local fuel costs (electricity or gas), it will pay for itself in 2-3 years with the savings you’ll have made. If you already have a gas or electric pool heater installed, you can use it as a backup for winter heating and use a solar pool heater as the main heating system the rest of the year. This will lower your costs drastically, and you can still enjoy swimming all year round. What’s In This Solar Pool Heater Buying Guide? For most pools and especially the bigger ones, a roof-mounted solar heating system is the best option. Mounting the system on the roof maximizes the amount of energy captured from the sun. It also allows you to install as many collector panels as you need without running out of space. 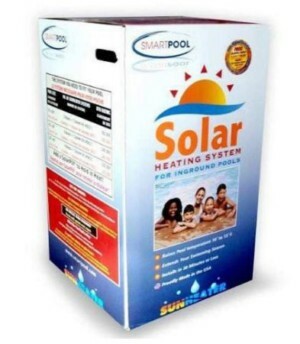 We recommend the SmartPool S601P SunHeater Solar Heating System together with the Hayward actuator, sensor and valve kit as well as the SmartPool installation kit. This solar heating system is perfect for large in-ground pools. Each panel covers an area of 80 square feet (20 feet by 4 feet), which maximizes the amount of solar energy collected. You’ll most likely need more than one of these panels to heat your pool reasonably quickly. Here’s the number of collector boxes the manufacturer recommends based on the size of your swimming pool. You’ll also need a system kit to install the heater. The kit includes various components for mounting the system on the roof and setting up the plumbing. The system kit is sold separately. Just one is enough for mounting up to 4 panels. If you want, you can also buy your own hoses and connectors. Installation is fairly easy if you have some experience with home projects. Some people will find it easier just to hire a pool company to do the installation. Once installed, the SunHeater system raises pool temperature by about 6°F to 10°F per day. Consider using a pool cover at night to retain that heat. To get the best results from this solar pool heating system, I highly recommend also buying the Hayward kit consisting of a valve, actuator, and sensors. This will allow you to control the flow and temperature of water. I’ve reviewed the Hayward kit below. You’ll also need the installation kit which is sold separately. Large surface area – heats a large pool quickly. Affordable (especially if you can install it yourself). No maintenance or running costs other than a few part replacements. Prone to minor leaks after a few years. Not ideal for winter use. A 3-way 24V valve is measuring two by 2.5 inches. The valve controls the flow of water depending on the roof and pool temperature. An actuator to automatically operate the valve. Two sensors, one for the roof heater and the other for the pool water. In addition to these three components, you also get a controller on which you can set your preferred temperature controls and other settings. The controller comes with LED indicators to show the current status of the pool heating system. Installing the kit is easy. You don’t really need to call a professional. The instructions are not very clear, but it’s easy to figure out where everything goes. Once installed, the kit maintains your pool at the set temperature. If the pool temperature drops below the set point, the valve opens to release warm water into the pool. It shuts off when the water gets to the right temperature. The system can detect when its nightfall and automatically switch from normal heating to nocturnal pool cooling. There’s also a recirculation freeze protection feature which keeps the water in the heater from freezing up in winter. Fairly easy installation (don’t rely on the instructions). Great water temperature control – the pool never gets too hot or too cold. LED indicators for easy monitoring. Easy to program to your preferred settings. 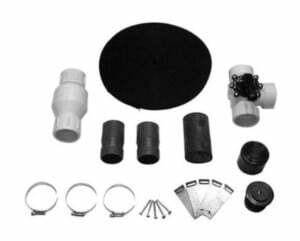 You’ll need this installation kit when you buy the roof heater system. A single kit is enough to install four boxes of the SmartPool collectors or 8 panels in total. If you don’t have a lot of space to set up a full-size roof pool heater, a compact system is a great alternative. It takes up little space, and you don’t even have to set it up on your roof. Most work well enough when set up by the poolside. Just make sure the heater is getting plenty of sunshine to maximize performance. Because of their compact size, I recommend compact solar pool heaters for smaller above ground pools. And even then you’ll probably have to buy and link several heaters to get a relatively quick temperature rise. Our favorite compact solar pool heater is the GAME Bubble Heating System. It consists of a dome-shaped collector and a bypass kit to connect several collectors (you’ll definitely need more than one). This one is a fairly inexpensive compact heater though the prices do add up when you buy two or three of them. Each solar heater is dome-shaped and comes with a clear cover to prevent heat loss. If you are not a big fan of how flat solar panels look, I think you’ll love these SolarPro heaters. Each heater has a total of 66 feet of heating coil. 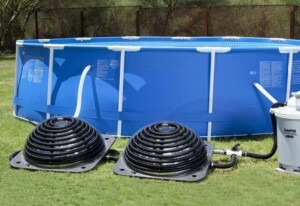 GAME recommends the system for above ground pools of up to 16000 gallons. That’s roughly a 32’ by 16’ pool. A single heater will raise the temperature by 5-10°F in 10 days. Add three more heaters, and your pool will be warm enough in 2 days. A couple of the heaters can warm a smaller pool in a few hours to 2 days depending on the number of gallons. Setting up the heater is easy. It’s something you can do yourself. Note that if you buy multiple heaters, you’ll need the bypass kit (see below). Compact. Saves plenty of space compared to large flat solar collectors. Easy to set up. No need to call a pro. Heats up above ground pools quickly. Comes with cover to prevent heat loss. Doesn’t work as fast for larger pools. May take a couple of days or more to feel a difference in temperature. You have to buy a bypass kit separately if you install more than one heater or if your pool pump is rated at 1 HP or higher (to avoid back pressure problems). Pricey when you buy multiple heaters. If you have a higher output pump (1 HP or more) or you are planning to install 2 or more of the XD2 systems, you’ll need this bypass kit. 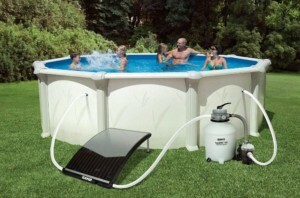 It’s also a requirement if you use the XD2 SolarPro heater with an in-ground pool (because of the more powerful pump). The bypass not only allows you to link more than one heater, but it also lets you bypass the heaters if the water starts getting a bit too warm. The bypass kit is fairly easy to install though you may need to do a few modifications to connect it to the existing hoses. Prevents back pressure problems in pools with high-output pumps. Works as advertised (with proper installation). Modifications may be required to fit the T connectors securely. Solar pool heaters tend to be quite pricey. A complete system for a medium-size or large pool usually costs above $1,000 to buy multiple heaters or collectors. That’s before you even factor in the installation costs if you can’t install the heater yourself. But recently, several manufacturers have started making cheaper pool heating systems. Of course, there’s going to be some tradeoffs in heating performance. That’s why these systems are mostly ideal for above ground pools. But with proper installation and a little patience, they work great. Our top recommendation is the SmartPool PolyPropylene Heating System. It consists of the SmartPool S240U Universal SunHeater, a roof mount kit and a systems kit for installation. 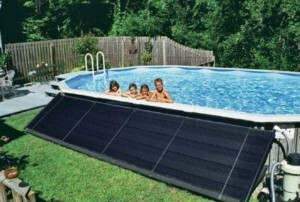 This is probably the cheapest 80 square feet solar pool heater you can buy. It’s still pretty affordable even if you have to buy a couple of them. But most customers found that just one is enough to heat their above ground pool. Note that the collector consists of two by 20 feet panels with a short hose connecting them. You can set up the heater by the side of your pool or up on the roof. Just make sure it is receiving enough sunshine wherever you decide to set it up. Everything you need to install the heater is included. This includes the connector hose, a roll of Teflon tape, four end caps, four hose clamps (stainless steel) and a detailed user manual. 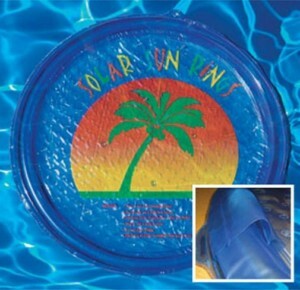 The package also includes a bonus solar pill to reduce heat loss from your pool. However, you’ll need to buy extra accessories for roof or rack installation. The kit we’ve reviewed below has everything you need for a roof/rack installation. The heater relies on your pool’s pump system to move water through the heating system. This works well in most cases but can sometimes interfere with the pool’s filtration. I recommend getting a separate small water pump just for the pool heater. Thanks to the large surface area of the collector, the heater works surprisingly fast. It will raise your pool’s temperature by a few degrees in a matter of hours on a sunny day. It also works fairly well when the sun is not so strong. In most places, you can open your pool a month earlier and close it a month later. In sunnier locations like California and Arizona, you’ll be able to enjoy your pool for most of the year. Affordable – excellent value for your money. All accessories included (except those required for roof/rack mounting). Large surface area – heats pool quickly in a matter of hours. You may need to buy a separate pump – a cheap 1 HP pump will do. When you are installing the SmartPool SunHeater system, the most important thing is to make sure it’s receiving enough direct sunlight. Otherwise, it won’t have much of an effect on your pool temperature. The best way to set it up is either on a roof or on a rack. It should be slanted so that it gets a full blast from the sun. This kit has everything you need to set up your SunHeater system on the roof or rack. This includes five 6-feet straps and fifteen stainless steel mounting brackets. It also comes with a detailed multilingual manual. One kit is enough to mount a 4’ by 20’ SunHeater system. The kit is easy enough to install on your own. The mounting brackets and straps are designed to withstand the elements without deterioration. You won’t have to make any replacements for years. Solar pool heaters come in different varieties from small 11 square foot rubber mats with tubes to huge roof-mounted 80 square foot systems. Here are the four main types of solar pool heaters. A solar heating mat is a much smaller version of a full-size rooftop solar collector. It consists of a series of black tubes that water runs through as it gets heated by the sun. Because of the small surface area, these mats are usually meant for small above ground pools. And even then you’ll need several of them to get your pool to warm up when the sun is out. The best thing about these solar heating mats is the versatility in installation. Their small size means you can set them up just about anywhere there is direct sunlight. You can lay them down on the yard, set them up on a rack by the poolside, mount them up on a fence or mount them on the roof. Another big advantage is that they are usually cheap. Most cost less than $100, and smaller ones go for less than $50. But costs can quickly add up if you need to buy several mats to cover a large pool. Much cheaper than full-size collectors. Easy and versatile installation options. Perfect for most above ground pools. You’ll need to buy multiple mats to warm your pool adequately. The bigger the pool, the more the number of mats you need. Not ideal for large in-ground swimming pools. These are also called evacuated tube heaters. The system works using a series of vacuum tubes. Each tube consists of two glass layers with a vacuum in between them. As the tube absorbs heat from the sun, the vacuum between the glass layers traps it inside the tube. The heat is then transferred to the pool water circulating within the system. Solar tube heaters work fast and efficiently. They are ideal for all kinds of swimming pools including large in-ground pools. Because of their ability to hold a lot of heat, these types of heaters work well in cold climates and seasons. On the downside, they are expensive. A single heating system usually costs over $700. You’ll probably need 2 or 3 of these heaters if you own a large pool. Ideal for all pool types. Ideal for use in colder climates or when the weather turns cold. Often requires professional installation – adds to the cost. If you don’t want to deal with the hassles of a conventional solar pool heater, a solar pool cover is a great alternative. You can also pair a solar pool heater with a solar pool cover for improved heating and to reduce heat loss. A solar pool cover warms up your pool in two ways. One, it ensures your pool retains the heat that’s already in it. It does this by reducing evaporation, the most significant cause of heat loss in a pool. Two, the pool cover captures solar energy, turns it into heat and transfers that heat to the water. There are several different types of pool covers. Solar blankets are the most popular. They look like bubble wrap. They magnify the amount of solar energy getting into the pool, the same way a magnifying glass causes a paper to go up in flames. The bubbles then trap this heat inside the pool. Solar rings are smaller and have to be inflated. You need to use several of them to cover your pool though they can’t cover the entire surface. While not as efficient as solar blankets, solar rings are cheaper and easier to handle. These days you’ll also find liquid solar covers. They come in the form of a solar pill or a bottle. You throw or pour it into the pool, and it forms a thin layer that covers the surface of the water and reduces evaporation. Cheaper than conventional solar pool heaters. They do multiple tasks – reduce evaporation, warm the water, retain heat and keep debris out of the pool. No professional installation or extra accessories required. They don’t heat the water as effectively as a solar pool heater. That’s why they are often used to complement a conventional solar, electric or gas pool heater. You have to remove the cover every time you want to use the pool (doesn’t apply for liquid pool covers). This can be especially tedious with a solar blanket. These are the most popular solar pool heaters. They consist of a large collector that goes up on the roof, a series of hoses to bring the water in and take it out back to the pool and a pump to push the water through the system. Smaller heaters can be hooked up to the pool pump. You’ll also need extra accessories such as valves, a controller, sensors, actuators, and valves. That’s not to mention everything you’ll need to mount the system on the roof. 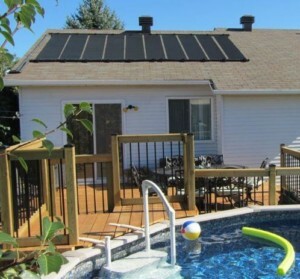 While pricey, roof-mounted solar pool heaters heat the water quickly and efficiently. They are great for large in-ground pools. Smaller ones work well with above-ground pools. They heat the pool fairly quickly. Some roof-mounted system can also be used for cooling the pool — ideal for large in-ground pools as well as above-ground pools. Pricey. They may also require professional installation which adds to the initial cost. Require a lot of extra accessories for setting up and mounting. You don’t need to prepare a rack to mount this pool heater. It comes complete with legs to brace it on the ground and has a curved shape to maximize its exposure to sunlight. Installation is easy. Everything you need is included in the box. 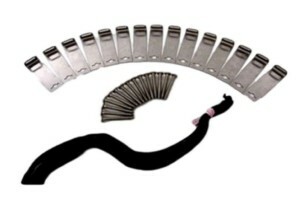 This includes stainless steel hose clamps and a couple of hoses. But several customers say the hoses are a bit short. So if you need to position the heater a bit further away from the pool pump to get more sunlight, you’ll have to buy a longer hose. There are also a few complaints about the legs breaking. It seems they are too delicate. Be extra careful when setting it up. One will not make a big difference even for a small above ground pool. For best results, get two or three for an above ground pool and 3-5 for an in-ground pool. If you decide to install multiple units, you’ll have to buy a separate GAME bypass kit. This allows you to connect various solar pool heaters. You’ll also need the bypass kit if your pool pump is rated at more than 1.5 HP – this mostly applies to in-ground pools which tend to have stronger pumps. The collector surface has a clear cover that traps heat inside. The curved design also reduces the cooling effect of wind. With one or two heaters, it will take a couple or so days to feel a significant difference in the water temperature. With more heaters and strong sunshine, you’ll be swimming in a toasty warm pool in a few hours. Curved design to maximize solar energy capture. Easy set up – no mounting required. Ideal for all above ground and in-ground pools. Multiple units required to achieve significant warming. Hoses included are too short. 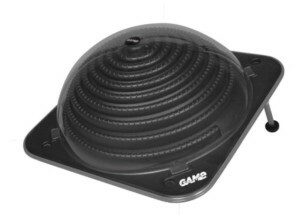 This pool heater also comes with a curved shape and two bracing legs underneath. So there’s no need to mount it up on a roof or rack. Just place it on the ground and slant it towards the sun. The legs on this heater are better quality. I have not seen any complaints about them breaking. The solar collector itself is not very big. It measures 10 square feet. But it’s designed to maximize the amount of solar energy captured. There’s the curved design that improves heating efficiency. It also has a clear polycarbonate cover on the surface that creates a localized greenhouse effect. It traps heat in the collector, ensuring the water passing through it gets most of the heat energy captured. On average, a single collector will warm up an above ground pool by around 10 degrees Fahrenheit in 10 days. But double up the number of collectors, or triple them, and you’ll have a warm pool in a day or two. 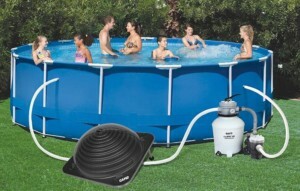 The pool heater is compatible with both above ground and in-ground pools. Installation is super easy. You don’t need a mounting kit, and all installation accessories are included. But depending on your pool situation, you may need to get a few extra items such as a separate pump, connectors, and hoses. If you buy multiple units, make sure you also buy a bypass kit. You’ll also need the bypass kit if your pool pump is rated at more than 1 HP. Alternatively, you can get a separate small pump just for the pool heater. Easy to set up. Installation accessories included and no mounting is required. Ideal for all types of pools. Curved design and a clear cover to maximize heating efficiency. Easy to drain when not in use. You may need multiple kits (plus a bypass kit) to warm up your pool faster. This one is pricey, but that’s because it is a complete system. The only accessory you’ll need to buy separately is piping going from the heater on the roof to your pool. Everything else is included – all installation accessories (connectors, 3-way valve, etc.) plus the mounting kit (brackets, straps and other components to secure it to the roof). The price is actually what you’d spend if you bought all these items separately. The bundled package saves you the hassle of buying individual pieces and kits. The SunQuest system is ideal for all kinds of pools, both in-ground and above ground. There are several panel options for different pool sizes. For small above ground pools, the 4-panel package will be adequate. For large in-ground pools, there’s a mega 18-panel package available. In between, there are options for 6, 8, 10, 12, 14 and 16 panels. Each panel measures 2’ by 12’. SunQuest has designed the system to allow straightforward DIY installation. It’s compatible with your pool’s pump, so you don’t have to hire a pro to set up a separate pump. They have designed the water inflow in such a way that there’s no risk of backpressure even with high-powered pool pumps. So just hook it up to your pump, and you are good to go. If you want, you can accessorize your system with sensors, an actuator and a controller for automatic temperature regulation. The Hayward GLC-2P-A Solar Pool Heating Control System we reviewed above is perfect for that. Once you’ve set everything up, your pool will start warming up within a few hours. Most customers report a 10-15 degree temperature rise in just a few days even in colder climates. To retain the heat at night, I recommend using a solar pool blanket. Versatile options to meet different pool heating needs. Complete system – makes buying and installation easier. Heats pool quickly and efficiently. Ideal for all pool types and sizes. Installation takes a bit of time – not surprising considering it is a complete system. 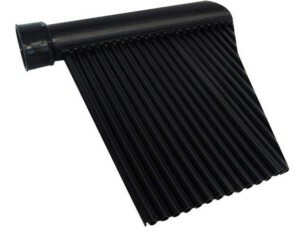 If you don’t want the curved GAME 4721 solar pool heater, they have this contoured alternative. It has a dome shape that maximizes the surface area exposed to the sun. Like the curved heater, this one also has bracing legs. You don’t need to mount it on anything. The heater has a clear polycarbonate cover that creates a greenhouse effect – trapping captured heat under the dome to increase heating efficiency. The heater is designed for pools up to 10,000 gallons. It will warm up the water about 5 degrees Fahrenheit within six days. That’s slow, I know. But you can hook up two, three or even five of these heaters to raise the water temperature a bit faster. If you decide to buy multiple units, you’ll also need the GAME bypass kit. Each pool heater is compatible with pool pumps rated at 1.5 HP or lower. If your pool pump is more powerful than that, use a bypass kit or buy a separate smaller pump just for the pool heater. Easy setup – all components are included. Foldable bracing legs – no mounting needed. Compatible with most pool pumps. You’ll probably need 2 or more of these units to heat your pool to a comfortable temperature. This is a complete heating system for above ground pools. It includes a single collector panel plus all the hardware you need to connect it to your above ground pool pump. But it doesn’t come with a mounting kit. If you want to set it up on a rack or up on the roof, you’ll have to buy the mounting kit separately. You can also just lean the collector against something like a stack of pallets or the fence. Just make sure it is angled in such a way that it captures maximum sunlight. If you have a small above ground pool (under 8,000 gallons) one panel will do though it may take a couple of days or more to feel a significant increase in temperature. For larger above ground pools, consider buying two or three panels and hooking them up using a bypass kit. Large 50 square feet surface area maximizes heating efficiency. You may need a separate mounting kit. Multiple panels are necessary for larger pools. You’ll also have to buy and install a bypass kit. Solar rings are a cheap way to warm up your pool and reduce heat loss. These consist of two vinyl layers: a clear upper layer and a blue bottom layer. The top layer allows sunlight to pass through to the bottom layer that turns about 50% of the solar energy into heat. It then transfers this heat to the water. The rest of the sunlight not captured by the bottom layer reaches the water and heats it directly. During sunny weather, the rings do actually warm up your pool by a few degrees. They are not as good as solar pool heaters, but they’ll extend your swimming pool season by a few weeks. What the rings excel most at is preventing evaporation, the main cause of heat loss in a pool. But the manufacturer recommends using a different insulation method at night. These rings can only cover 80-90% of your pool. There’ll still be significant heat loss when it’s cold. To keep your pool warm, switch to a pool cover that provides complete coverage. There are several solar ring packages available starting from a 3-pack to a 12-pack. You can also buy a single solar ring to replace a faulty one. They work best in small and mid-size pools. In large pools, you’ll need quite some rings, and it can be tedious to inflate all of them every time you want to warm up your pool. An affordable way to warm your pool and keep it warm. Different pack sizes are available for different pool sizes. Tedious to use in large pools. Most packs come with at least one or two fault rings that won’t stay inflated – but the company will send you replacements promptly — no ideal for night use. 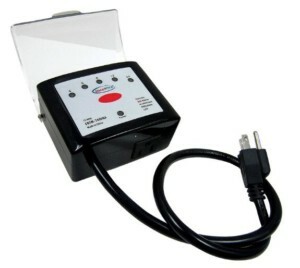 This 2’ by 20’ heater can be hooked up to any above ground or in-ground swimming pool. The number of panels you’ll need will depend on the size of your swimming pool. Each kit contains only one 40 square foot panel. To determine the number of the panel that you’ll need, calculate 75% of your pool square footage. That’s the minimal collector area necessary to warm your pool within a reasonable amount of time. If for instance, you have a 400sf pool, you’ll need around seven of these panels. Installation is a bit tedious. You’ll have to buy a roof/rack mounting system and extra accessories to connect the heater to the pool. Some customers also say they had to deal with leaky connectors. But once you set it up, it works like a charm. On a good day, it will warm the pool by 5 degrees or more. In extra sunny weather, the water can actually get too warm for your comfort. If that happens, you can use the system to cool the pool. Just run the pump at night to get water to move through the heater. Unlike during the day when the water absorbs heat, at night it will radiate heat into the air and cool your pool by a few degrees. So you essentially have a dual pool heater and cooler. Includes 3-way valve to control water flow and prevent back pressure. Can be used with any above ground or in-ground pool. Fast and efficient heating – with good weather and the right number of panels. Can do double duty of heating and cooling. 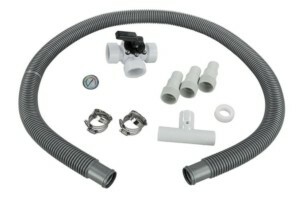 Requires mounting kit and extra accessories for plumbing — leaking issues around connectors. This heater comes with a 2ft by the 20ft collector. That’s a 40 square foot area for sun collection. You’ll need at least two of these for a small above ground pool. For an in-ground pool, consider getting 4-6 panels depending on your pool size. With the right number of panels and agreeable weather, the heater will warm your pool by 10-15 degrees in a couple of days or so. Installation is not very straightforward. For one, you’ll need to get a mounting kit to set it up on the roof or rack. You cannot place it flat on the ground since it will not get the proper sunlight exposure. The kit includes some fittings such as connectors, but they are not guaranteed to work with your existing plumbing. As many customers found out, you may need to buy your own connectors and adapters to finish the installation. You’ll also need to get a hose that will carry water from the pool to the heater and back. It’s something you can do on your own if you have time. If your schedule is busy, get a pool expert to do it for you. The system works great once you set it up and there’s almost no maintenance required. Large surface area to maximize heating efficiency. Some installation hardware is included. Requires mounting kit and a few extra accessories. A programmable timer lets you control when the solar pool heater is operational. It’s a cheaper alternative to buying a controller kit with sensors and actuators. The timer turns the pump on and off at the set times. This is handy in hot areas or during hot weather when there’s a risk of the pool getting too hot. You can run the heater for a certain number of hours and switch it off before the water gets too warm. You can also set the timer to run at night to cool off the pool. This is a simple, straightforward timer that’s easy to use. You connect it to your pool pump (or a dedicated pool heater pump) and then set the number of hours the pump will run. The timer is easy to use, but it is a bit inflexible. It runs in 24hr periods. You can only set the number of operational hours during that period. There are five options: 4, 6, 8, 12 and 24 hours. You cannot set it to come on at a particular time. Instead, it will switch the pump on when you set the timer and run it for the number of hours you have selected. It will then come on again the next day at the same time. It’s not very versatile, but it will do for most of your needs. And for the price, you won’t get a better timer. It comes with support for mounting, a 2ft cord, and a 15amp outlet. There is also a clear cover to keep out the elements. If a programmable timer doesn’t quite meet your needs, I recommend a temperature control system. It consists of at least two temperature sensors (one for the collector and another for the pool), an actuator to control a 3-way valve and the valve itself. Once you set your preferred pool temperature, the system will work automatically to maintain it. If the collector gets hotter than the pool water or goes beyond a set temperature, the valve automatically shuts down water flow to the collector. This is a much more accurate way of keeping your pool at the perfect temperature. It comes with an actuator, a 2” 3-way valve and two sensors. A roof mount kit is necessary if you are planning to install the solar pool heater on the roof or rack. It usually includes mounting brackets and straps to keep the panels in place when it’s windy. Some solar pool heaters come with a roof/rack mounting kit included. But in most cases, you have to buy one separately. Solar pool heaters typically also manufacture mounting kits. So it’s easy to find one that is compatible with your particular solar pool heater model. Another accessory you’ll probably need is a bypass kit. It slows down water flow through the heater and redirects some or all of the water away from the heater. There are three situations when a bypass kit is required or even mandatory when you are linking multiple solar pool heaters. A bypass kit ensures water is not moving too quickly through the heater. This prevents damage to the heater tubes and maximizes the amount of heat collected by the water as it passes through when you are using a pump that’s more powerful than what the manufacturer recommends. If your pool pump is too powerful for the heater, it can create backpressure and affect your pump’s functionality. A bypass kit allows some of the water to bypass the heater to avoid pressure buildup when you don’t want the water to cool off at night. If you leave your solar pool heating system running at night, it’s going to radiate heat from the water running through it to the air. Your pool is going to cool down. A bypass kit lets you shut off water flow to the heater. So even if the pool pump comes on at night, there will be no cooling. Most solar pool heaters are designed to work with the existing pool pump. But using the pool pump is not always ideal. The heater can create backpressure which will affect how well your pump runs and can prevent proper filtration. You can solve this problem with a bypass kit, but not everyone is willing to spend money on one. Sometimes you also want to control the heater system separately from your pool pump. Other times, it’s not possible to connect the pool pump to the heater for one reason or another. Buying a separate pump will solve these problems. You can get a pump that has just the right amount of power and control it separately from your main pool pump. Luckily, you don’t need an expensive water pump. Most solar pool heaters will work with cheap low-powered pumps. What is a Solar Pool Heater? 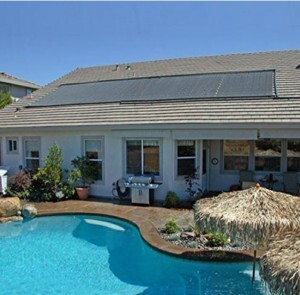 A solar pool heater is exactly what – a pool heater that uses solar energy. Conventional pool heaters use either electricity or natural gas to warm the water. While these methods are beneficial, they are expensive. They can cost as much as $500 a month in terms of energy consumption. 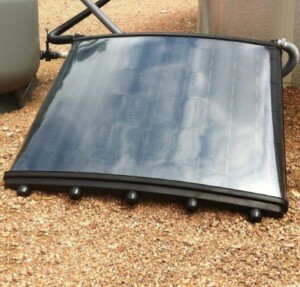 A solar pool heater, on the other hand, costs between $50 and $200 a month to run. Yes, a solar pool heater uses free energy from the sun. But you still have to operate a pump to move the water through the solar heater. That’s what costs a bit of money every month. A collector to capture solar energy. A pump to push pool water through the collector. This can either be the pool pump or a separately dedicated pump. The collector can be set up on the roof, on a slanting rack on the ground, directly on the ground or on the fence. It can be a single panel or multiple panels linked together using connector hoses. The pump draws cold water from the pool and sends it through a pipe into the solar collectors. In some pool heaters, the water passes through a bypass valve that slows down water flow to increase heating efficiency and prevent damage to the collector. The collector panels consist of tiny tubes. As the water slowly passes through these channels, the sun heats it directly. Collector panels are black to absorb more heat from the sun. Some also have a clear cover on top to trap heat inside the collector (the greenhouse effect). The now-heated water comes out at the other end of the solar collector and flows through a pipe back to the pool. This cycle keeps going until the pool warms up to a comfortable temperature. What Are the Benefits of Solar Pool Heaters? For homes located in colder climates, keeping the pool warm using an electric or gas heater can be quite expensive. Switching to a solar pool heater for most of your pool heating needs will save you more than half your pool energy costs. If you live in a warm place, you can rely on just a solar pool heater. In colder places, you can use a solar pool heater when it’s sunny and only turn on the gas/electric heater in cold seasons. While the initial cost of buying and installing a solar pool heater is somewhat high especially for a large in-ground pool (though the costs have come down in recent years), the system will pay for itself in a few years. With a solar pool heater, you could be swimming a full month before the swimming season kicks in and still be enjoying your pool a month or longer after your neighbors have closed theirs. Instead of the usual 3-4 months of swimming, you can enjoy your pool half the year or even longer in sunnier climates like Arizona or Florida. The great thing about solar pool heaters is that it doesn’t have to be very sunny for them to work. The pool heater maximizes the little sunshine there is to heat your pool. A solar pool heater will not warm your pool at night. But it will warm it enough during the day that you can keep swimming even after dark. To retain as much of the heat as possible, I highly recommend a pool cover. Swimming is excellent for your health. But too often, a cold swimming pool keeps people from swimming as often as they should. A warmer pool should encourage you to take a dip more regularly – it’s good for your heart, your muscles, and mind. It’s also safe for people with injuries, asthma, and multiple sclerosis. But it’s not just swimming that is good for your health; swimming in warm water is also beneficial. It can improve your workout performance. It is also a form of therapy for people with conditions such as osteoarthritis. Experts generally recommend a swimming temperature of 82-88 degrees Fahrenheit. Most solar pool heaters can efficiently heat your pool to that temperature range. Solar pool heaters require very little maintenance. All you need to do is occasionally check for leaks. Most systems also need to be drained during winter to prevent damage from frozen water. Solar pool heaters can withstand all kinds of elements including sunshine, rain, snow, and strong winds. So even though they are exposed, you won’t need to make frequent part replacements. A good quality solar pool heater can easily last 10-20 years or more. Solar pool heaters use free clean energy from the sun and very little electricity to run the pump: no emissions and no pollution. These pool heaters use the sun’s heat to warm your pool. See my explanation above for more on how a solar pool heater works. An electric pool heater works the same ways as an electric water heater – by using electrical resistance. Electricity heats a coil which then heats up the water. An electric pool heater should be your very last option. All the others are better. Not only is an electric pool heater expensive to run, but it is also slow. It is inefficient and uneconomical, especially for large in-ground pools. If you need an electric pool heating system, get a pool heat pump. It is much more efficient to operate, and it will heat your pool faster. A pool heat pump doesn’t generate heat. It just transfers heat from the outside to the water. This is what makes it energy efficient. 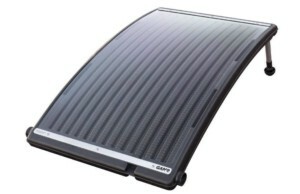 Unlike a solar pool heater, it doesn’t rely on the availability of sunshine. It can work at night and even during mild winters. If you are looking for an affordable way to keep your pool warm for most of the year, even during fall and winter, an electric pool heat pump is the best option. Natural and propane gas heaters are the most common types of pool heaters especially for in-ground pools. They can heat the pool quickly and to any desired temperature. They can be used all year round even during winter. The biggest downside of gas heaters is the cost. It will cost you more than $4,000 a year to heat a standard in-ground pool using natural gas or propane. With natural gas prices steadily going up in the last one year (currently $3.20 per gallon), expect costs to go higher. If your budget allows, natural gas and propane pool heaters are the best options in terms of heating performance. To lower your costs, consider using a solar pool heater during the warm months and switching to a gas heater when the cold season sets in. Solar pool covers are a low-cost way of warming the pool using the sun and preventing heat loss through evaporation. Read the section above on solar pool covers for an explanation of how they work and the different types available in the market. + What the Difference Between a Pool Heater and a Heat Pump? It’s easy to get confused by these two types of heaters because they both usually have the term ‘electric’ before them. But an electric pool heater works very differently from an electric heat pump. An electric pool heater works via electrical resistance, the same way an electric kettle works. The electric current heats an element that then heats the water. An electric heat pump transfers heat from warm air outdoors to the cold water in the pool. Here’s an easy way to differentiate them: a pool heater generates heat while a heat pump transfers heat. Because a heat pump doesn’t generate heat, it uses less electricity than a pool heater. It’s, therefore, more affordable to operate. But unlike an electric pool heater that can warm the pool at any time of the year, a pool heat pump is most efficient during warmer months. How to Choose the Best Solar Pool Heater? The total surface area of the solar pool heater – or more specifically, the solar collector – should be at least 75% of your pool’s square footage. 100% is even better. Your pool will warm up faster. To determine the number of solar panels you need to buy, calculate the square footage of a single one and then divide that number by the total square footage you need (at least 75% of your pool’s area). Standard pool heater collectors measure 2 feet by 20 feet. That’s 40 square feet. If you have a 400 square feet pool, ten panels would be the best number. It would match your pool size. Eight panels (80% of pool size) would also be enough to heat your pool to a comfortable temperature within a few hours. + How Fast Do You Need Your Pool Heated? One or two collectors could take as many as five days to raise your pool temperature to a comfortable 82 degrees Fahrenheit. If you don’t mind the extended waiting period, no need to spend money on a bigger system. I recommend using a pool cover to prevent heat loss at night. Otherwise, you’ll be starting from zero every morning, and your pool will never get warm. If you need your pool to warm up in ab, you’ll have to invest in more panels. Here’s the bottom-line: the more the number of solar collectors the faster your pool will warm up. But beyond a certain number, more is not always better. It’s possible for your pool to get dangerously hot. Even if it doesn’t scald you, swimming in overly warm water could cause dehydration, muscle spasms, and extreme fatigue. 75% coverage is good, 100% coverage is better, beyond that the extra panels are unnecessary. Solar pool heaters range in price from around $100 for small above ground pool heaters to $2,000 or more for complete pool heating systems for in-ground pools. In the last few years, prices of solar pool heaters have gone down. You can get a decent complete system for a standard in-ground pool for $1,000 or less. And since most of these heaters are designed for DIY installation, you don’t always have to spend more money on a professional installation. Generally, a basic above ground pool heating system will cost you $200-$500. 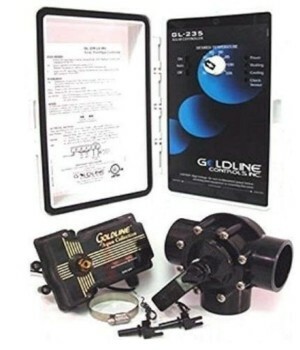 This includes the price of 2-5 collectors depending on your pool size, a bypass kit and extra accessories. A roof-mounted heating system for an in-ground pool will cost you $500-$2,000. 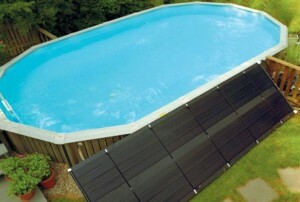 This includes 2-10 panels depending on your pool size, plumbing accessories and a mounting kit. Costs will be higher if you opt to hire a pro or add extra accessories such as a dedicated pump or temperature control system. The size of your pool will determine how many solar collectors you’ll need. We’ve already discussed that above. The bigger your pool, the more panels you need. Pool shape doesn’t matter when choosing a solar pool heater. The system will heat a rectangular pool the same way it does a kidney-shaped pool. If they have the same number of gallons of water, it will take the same amount of time to achieve a certain temperature (all other factors such as weather being similar). 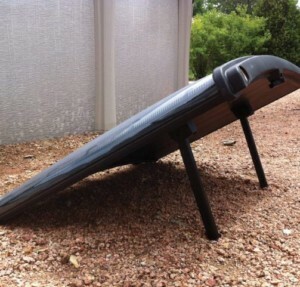 Even if you are planning to buy a solar pool cover, shape doesn’t matter. Most solar covers can be cut to the shape of the pool. The main difference between in-ground and above ground solar pool heaters is the size. An in-ground pool heater will have more panels to generate more heat. It will also have more fittings including hoses and valves to carry the water from the pool up to the roof where the heater is and back. An above ground pool heater doesn’t have to heat as much water, so they tend to be smaller (and cheaper). It will usually include 2-5 small collectors linked together using a bypass kit. The collectors are often set up on the ground rather than on the roof. There are also universal solar pool heaters can be used with any type of pool. A solar pool heater is an efficient, cheap and eco-friendly way to extend your swimming pool season. Even if you already have a gas heater installed, it’s still a good idea to get a solar pool heater. It will drastically reduce your heating costs.